At Renault, they refer to it simply as 'the problem'. It's the itch that can't be scratched, the illness with no known cure, the question without an answer. And what a problem. For the past two seasons, the Anglo-French team made it look almost too easy to build a title-winning Formula 1 car. Last year's stunning R26 and its 2005 predecessor, the R25, were brutal in their total efficiency: aerodynamically slippery, unremittingly reliable and child's play to drive. In every sense, Renault had it nailed. That only makes it harder to explain why this year's R27 chassis - a thoroughly logical upgrade of last season's title winner - has so far resoundingly failed to set the track on fire. Yes, the departure of Fernando Alonso may have left a superstar-shaped void but, with the team struggling to break both cars into the top 10, it would be misleading to explain away the loss of pace simply to the world champion's absence. This is an engineering problem - one that requires diligent, sustained and painstaking hard work from the factory floor, the management and the drivers themselves to solve effectively. And, while fixing it will not earn the team the plaudits that came from winning back-to-back world titles, it will be no less of a test - and could even end up being viewed as a greater personal triumph. The seeds of the problem can be traced back to Formula 1's adoption of Bridgestone control rubber last November. Renault quickly realised the characteristics of the Japanese tyre fundamentally differed from the Michelin. More worryingly, the new rubber seemed to suit some cars better than others - and the Renault R26 suffered particularly badly from the switch. "We weren't the only team to have a problem with the tyres," says executive director of engineering Pat Symonds. "Honda and Red Bull suffered it too. And maybe some other teams got a reverse effect. McLaren were the classic example; they went from being several tenths slower than us to being several tenths faster." It would appear Renault was so tuned in to the French rubber it suffered more than its rivals when the French manufacturer pulled the plug. Remember, too, that Michelin's 'tyre-war' rubber was individually tailored to each team and would have compensated for - and maybe even hidden - all manner of slight, quirky handling characteristics that could be dialled out through clever tyre development. There's also a tacit admission from the team that it focused a little too strongly on its 2006 campaign, which wrung out the entire organisation as it struggled to hold Ferrari at bay. With too little resource put aside for '07, perhaps the R27 lacks the refinement of its predecessors. Both Symonds and team principal Flavio Briatore accept this might be the case. Clearly, Renault lost something in the reshuffle. "The biggest problem is overall grip - mostly in the high-speed stuff," says new driver Heikki Kovalainen. "We're a bit limited with front grip, and it's on the knife edge in high speed. If you go in a bit too fast you can lose a lot of time. And it's a bit inconsistent too - that's our biggest problem." Giancarlo Fisichella agrees: "One day the car will look okay," he says. "But the next day, with different temperatures, the car behaves completely differently. So it's hard to find a proper set-up; you fix the problem in one corner only for it to get worse in another." If anything, the team's performance in last week's Bahrain Grand Prix showed the R27 is moving further away from the sharp end of the field rather than closer. 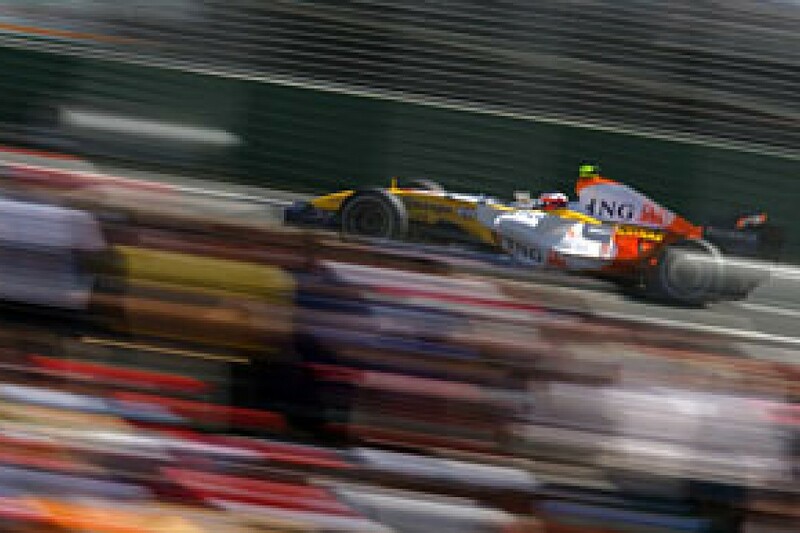 In Australia and Malaysia, Fisichella's safe pair of hands brought the car home fifth and sixth respectively, behind a gaggle of Ferraris, McLarens and BMW Saubers. At Sakhir, both cars sunk miserably into the midfield mass that continually fights for the tail-end points, coming home eighth and ninth. Naturally, the team wants to steer clear of edging into such dangerous waters, but without a firm handle on the problem there is nothing to stop the car from slipping backwards. "You just have to solve things methodically," shrugs Symonds, one of the deepest thinkers in the F1 paddock. "Firstly, you eliminate the impossible. Then, whatever you're left with - now matter how improbable - needs to be sifted through. Unfortunately, that's the process we're in. But in getting negative answers, you are at least eliminating things and getting down to the nub of the problem." It's not the first time Renault has had to methodically comb through the minutiae of one of its cars to iron out a problem. Back in 2004, the R24 suffered a fundamental chassis-stiffness problem that stymied its progress. But with little to play for, the team took the decision to abandon the car, axing development at mid-season in order to place all its eggs into the R25's basket. It was the right move. But if the case of the R24 teaches us anything, it's that curing a racing car's handling hiccups is a long, painstaking and often unrewarding process. Even if a problem is relentlessly pursued, it can take months to fix. 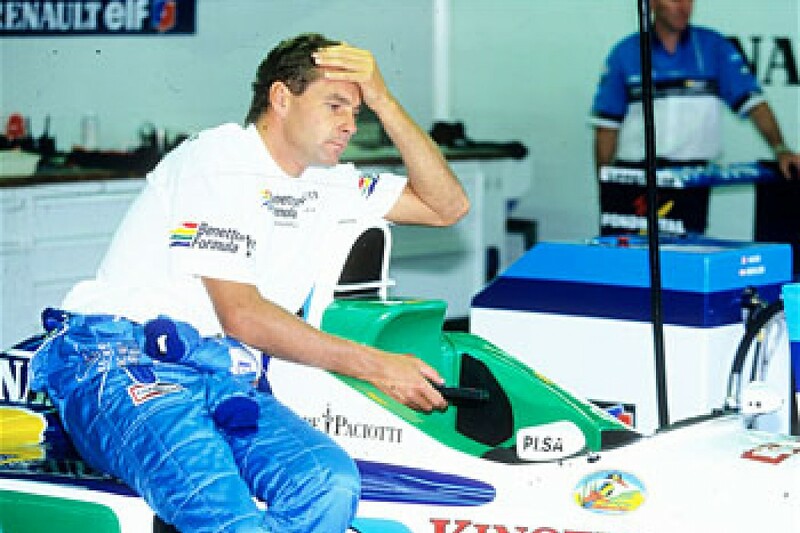 Symonds acknowledges that problematic racing cars can habitually take a long time to sort. But can Renault afford to untangle a formerly winning operation in order to solve its current problem? This is where it gets difficult, according to Symonds. "You've got to balance solving the problem without falling too far behind on other things," he says. "You've got to maintain the normal seasonal progression. You've still got to design your wings and brake ducts for Canada, for example, even if you're not sure that there's something screwing those up. But if you don't solve the problem until you're three quarters of the way through the season, then you're not going to pull yourself back to the front. That's obvious." Is it just coincidence that Renault has floundered just as reigning world champion Fernando Alonso left the team? Probably. But while Alonso has also struggled to acclimatise to Bridgestone's new tyres, you can't help but wonder if his ability to push a car beyond its limits and his determination to sort mechanical problems would have helped the Enstone engineers identify, and possibly even solve, their problem. "Sure, we've lost a big asset," says team principal Flavio Briatore. "But that's confusing the issue. We know exactly how Fisi works and how he provides feedback to the engineers. And Heikki tested with us for 20,000km last year and his feedback has been faultless. 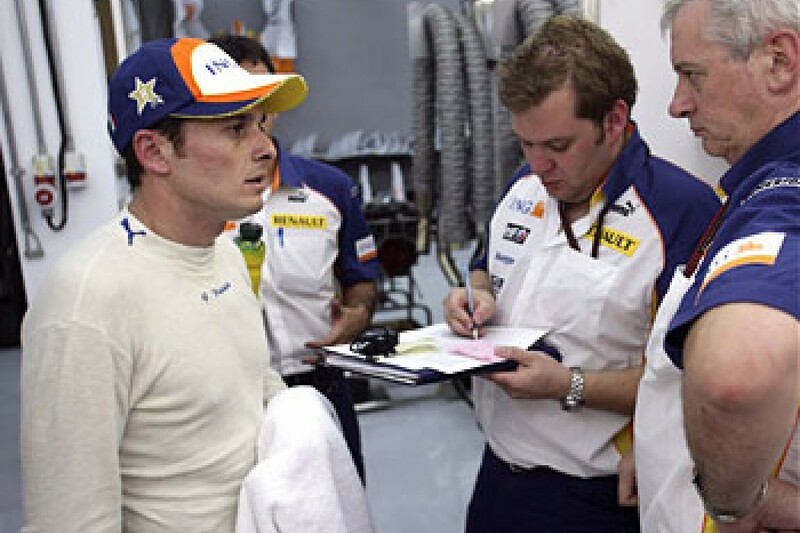 Whenever he found something good on the 2006 car, Fernando and Fisichella immediately confirmed his findings." Fisichella is also quick to dismiss the theory that the Spaniard was single-handedly responsible for the team's two-year surge. "You can't claim that the car is no good any more because Alonso has gone," he says. "If he'd been here, there would still be a chance that the same thing could have happened. Even he would struggle to get into the top 10." Symonds also refutes the idea that Fernando somehow elevated Renault above the natural pecking order, and that Fisichella's pace was a more accurate reflection of the team's position during '05 and '06. "You don't punch above your weight for two years," he says emphatically. "You can do it for a race or two, but I'm not sure you can do it for much more than that. You certainly can't do it for two years. It was a sign of the team's class that we won back-to-back titles." Besides, simply applying an Alonso-shaped Band- Aid wouldn't necessarily have brought all the answers required. Indeed, if his contract had not expired at the end of last season, it's more than likely that a less invigorated Alonso would have struggled with the R27's performance black hole and would only have sharpened the Spaniard's impression that Renault was a team sometimes struggling to remain at the sharp end. The easiest way to explain away Renault's 'problem' is to shrug it off as a sporting mishap - the inevitable flipside to two years at the top. The F1 boom-bust cycle regularly claims fresh victims, allowing a team to surf the crest of a wave only to crash to the shore while another stronger undercurrent - carrying another team - gathers anew. Renault, some say, has enjoyed the boom. And 2007 is the start of another cycle of growth. "You see it so many times in F1," says Briatore. "Look at Ferrari, Williams, McLaren. It's the normal cycle you have in this sport. It's so competitive that the smallest difference - 0.02sec here, 0.1sec there - means you can finish a lap or two behind or three tenths slower. And that's the difference between fourth fastest and being ninth." But can Renault afford to spend another year pushing to get back to the front? After all, Renault F1 president Alain Dassas vowed last year that the team's future in Formula 1 was assured - but only as long as it kept winning. Clearly, that ambition has slipped from the radar a little in 2007, but there's nothing to suggest that Dassas will imminently pull the plug if results aren't forthcoming. However, his edict will prove more of a threat next year if the team still hasn't regained its composure and winning ways. "Having been successful in 2005 and 2006 really makes me wonder where we went wrong," sighs Symonds, a man who has clearly had 'the problem' rattling around his brain for too long. "The tools and the methodology that we applied to winning the last two world championships haven't changed at all. Fernando may have left the team, but it's the same group of engineers responsible for designing, developing and exploiting the car. So it does make you wonder how you can drop off on something like this." 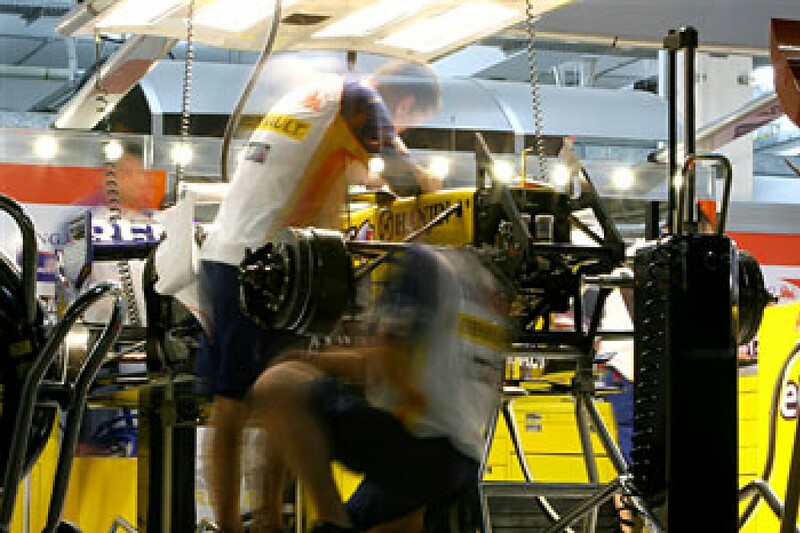 Clearly, the problem is deep-rooted within the R27, hidden beneath layer upon layer of nuance and detail; something that has yet to be picked up on by some of the most experienced and knowledgeable engineers in the pitlane. As F1 enigmas go, this perfectly encapsulates the yawning chasm that exists between F1 success and failure. In reality, the car is just missing a handful of tenths, but that hidden potential has become a hugely irritating yet endlessly intriguing conundrum for those trying to solve it. "What this whole episode does is demonstrate some of the extreme subtleties of what we're doing with engineering," says Symonds with a determined grin on his face. "So for sure, when we find the answer it will be an amazing subtlety: one of those things where you bang yourself on the forehead and say, 'Jesus, I'd never have thought of that one.' And I guarantee you, we will find the answer..."
1996 - WHY IS IT DIFFERENT? On the surface, Renault's slump in fortunes perfectly mirrors the similar dip it suffered, as Benetton, back in 1996. After all, the similarities are almost perfect: the team had just come off the back of a two-year title-winning streak, had just lost its young champion (in this case Michael Schumacher) to a rival team, and had suddenly plummeted from race winner to middling top-10 runner. Could history be repeating itself? Briatore claims that the dip the team experienced in '96 was brought about by not having a sufficient budget to match the burgeoning assaults of Williams, McLaren and Ferrari. For Symonds, comparisons between the two eras are misleading. "We had a damn good car in 1996 but we didn't exploit it properly," he says. "The difference now is that we haven't actually got a very good car, but we haven't got the arrogance that we had back then. "And it really hurts when people draw those parallels," he continues. "We're a very different team from what we were in 1996. Back then, we were incredibly arrogant - we really did believe that Michael leaving at the end of 1995 was an inconvenience. "Obviously, it was not something we would wish for, but we didn't think it was the end of the world and that it wouldn't be too difficult to pick up from where we left off. Boy, did we learn that wasn't true!"